The district plans to open the reservoir for public use on April 26, but please call (928) 477-2255 for updates. This narrow, winding body of water looks more like a canyon-bound river than a lake. Nestled between forested canyon walls it provides picturesque water recreation in a secluded, wooded setting. If fishing is your cup of tea, you can catch rainbow, brown or brook trout here, stocked by the Arizona Game and Fish Department. If your taste runs to other types of recreation, the sightseeing, wildlife watching, hiking, and mountain biking here in the canyon-carved uplands of the Mogollon Plateau will make you glad you chose to visit this out of the way lake. In 2018, C.C. 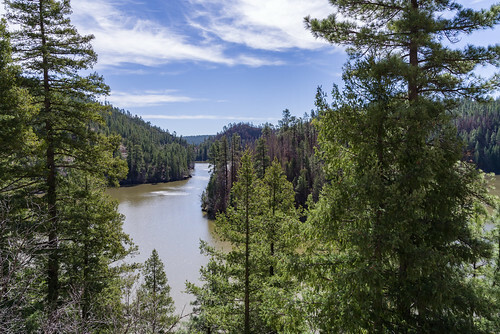 Cragin Reservoir will become an important water source for the town of Payson, Arizona. Forest thinning and prescribed burning in the area under the Cragin Watershed Protection Project will help protect this valuable water source and improve forest health in the area. C.C. Cragin Dam was built in 1965 by Phelps Dodge, and later transferred to the Salt River Project (SRP). Learn more about the reservoir's history on SRP's history of C.C. Cragin dam and reservoir. Tentative opening date: April 26. Contact District for updates. Boats are restricted to a single electric motor or a single gasoline engine 10 horsepower or less. No vehicles over 22 feet long on FR 751 in restricted area southeast of Rock Crossing Campground. No vehicles with trailers in excess of 50 feet overall in restricted area. No parking except in designated parking spaces on FR 751 in restricted area. No swimming within 50 feet of a boat ramp or dock. See the Forest Order 04-16-12-R for details, map, and background information on the parking, vehicle length, and swimming restrictions. Location: 63 miles south of Flagstaff on a graveled forest road. Access: Drive 55 miles south of Flagstaff to Clints Well on Forest Highway 3 (Lake Mary Road). Turn northeast (left) about 4 miles on AZ 87 to FR 751 then southeast about 6 more miles to the reservoir. All roads are paved except FR 751 which is graveled and suitable for passenger cars in most weather. In wintertime, FR 751 is closed and the reservoir is not accessible. Facilities: 32 single unit campsites and 2 double unit sites with tables, fire rings, and cooking grills at Rock Crossing Campground, drinking water at the campgrounds, toilets (self-composting), boat ramp, hiking trails nearby. No parking on boat ramp. Wait for next available space. Boat launch area has a 5 minute maximum vehicle use. No swimming at the boat launch. Do not block or interfere with boat launching. Use the make-ready area to prepare before using boat launch. Boat motors limited to a maximum of 10 horsepower.